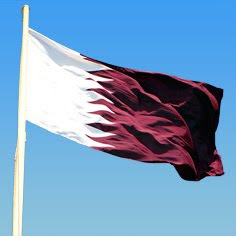 The first flag for the emirate of Qatar was a simple red banner, similar to Bahrain. Then, in 1860, a thin white serrated stripe was placed along the hoist of the flag. The number of points was set at 9, to mark Qatar as the 9th reconciled Emirate after the conclusion of the Qatari-British treaty of 1916. In 1936, the flag was altered, with the white stripe featuring 9 points, and 10 diamonds. The shade was darkened down from red to purple, and the name of the state was written in Arabic in the middle of the flag. 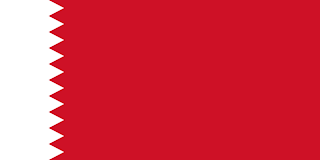 In 1946, the flag was modified once more, by being simplified. The diamonds where removed, along with the name of the state. Finally, in 1971, the flag was altered once more, with the dimensions being changed slightly. There is a story behind the choice of purple for the flag. The legend states that a new red dye was being used to colour the flag, and whilst it was left to dry in the sun, the sunlight altered the colour, toning it to purple. This colour was kept as it was felt to be far more beautiful than the original red!